In just a matter of days, the British public will know if UK Prime Minister Theresa May has managed to convince her divided cabinet and party to support the draft Brexit deal on leaving the European Union that she has reached after almost two years of negotiations. It is crunch time and the moment of truth for all the parties involved in this difficult and unprecedented process of disentangling more than 40 years of economic, political, cultural, trade and military relationships. According to the timetable, European leaders are set to sign off the draft Withdrawal Agreement and framework for the UK’s future relations with the EU in Brussels on Sunday. May will then submit the draft deal to the UK parliament to ratify in a process that may be unlikely to succeed. Although May has managed to get her cabinet to support the draft deal, she is not out of the woods yet. The 585-page draft Withdrawal Agreement, published last week alongside a shorter statement setting out what the UK and EU’s future relations will look like, is still problematic for many UK politicians. Many of them have declared they would rather bring the government down, call for early elections, or support a second referendum than pass the draft agreement. The ratification process is also proving to be anything but straightforward in London and Brussels. In a sign of tension on the EU side, Spain said it would not agree to the draft deal without clarity over how talks on the future status of Gibraltar will be handled. In London, Brexit Secretary Dominic Raab and Work and Pensions Secretary Esther McVey were among seven ministers to resign in protest at the deal, saying it had failed to “honour the result” of the earlier referendum and had crossed May’s “red lines” for leaving the EU. Other ministers such as International Development Secretary Penny Mordaunt, leader of the Commons Andrea Leadsom, Secretary for International Trade Liam Fox, Secretary for the Environment Michael Gove and Secretary for Transport Chris Grayling are pressing May to re-negotiate the most problematic parts of the deal, especially those related to the Irish border and the “back-stop” scenario that is without a timetable or expiry date. If May fails to convince them to back her deal, she will struggle to get her plans through the House of Commons. The most controversial part of the deal is about Northern Ireland, starting on page 302 of the draft agreement. This addresses the Northern Ireland “back-stop” or the insurance arrangement that aims to guarantee that physical checks will not be reintroduced at the border with the Irish Republic in the event of the EU and the UK failing to agree a deal on future trading relations after December 2020. EU Chief Negotiator Michel Barnier has said agreement on the back-stop will protect the Good Friday Agreement that ended the violence in Northern Ireland and at the same time respect the integrity of the UK. He has stressed that the back-stop is “not meant to be used” and would only kick in if there was no better solution by the end of the transition period. The back-stop within the agreed draft would avoid a return to a “hard border” with the Republic of Ireland by keeping the UK as a whole aligned with the EU customs union, but without any timetable for withdrawal. This means that the UK will continue to be in the EU customs union until a solution is found to the Irish border problem. Any solution could take months or decades, to find. UK hard Brexiteers are furious at the proposed solution, but it has also proven to be the most contentious part of the withdrawal negotiations, with concerns being raised by Brexiteer MPs, Labour Party MPs and the Northern Irish Democratic Unionist Party (DUP) over how it will work. Instead of consolidating her power after reaching a compromise deal, May has found herself in a weaker position after revealing her plans, and she is under pressure from the right wing in her own Party, the Labour Party, the DUP, the Scottish National Party (SNP) and the Liberal Democrats. The DUP has made it clear it cannot support the agreement as it stands. 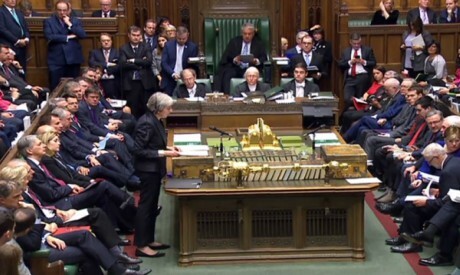 In a clear warning to May, the Party’s 10 MPs withheld their support on votes on budget measures in the UK this week, calling it a “message” over May’s plan to “separate” Northern Ireland from the rest of the country. The DUP has warned May to “keep her side of the bargain” on Brexit, which means it will not support the final deal in parliament. Labour has called the deal “the worst of both worlds,” while the Brexiteers in the Conservative Party have labelled it a “betrayal” of voters and appear intent on forcing a confidence vote in May’s leadership. There are already more than 20 letters of no confidence in the British PM with the chairman of the 1922 Committee of backbench Conservative Party MPs. If he receives letters from 15 per cent of the Party’s MPs, or 48 MPs, a secret ballot on May’s leadership will be triggered. May is adamant that her draft withdrawal deal, which MPs will vote on next month, is the right one. However, the gulf between her and the hard Brexiteers within her Party is widening, and the threat of the Conservative Party splitting is becoming very real. “If the PM ignores the Brexiteers’s voices and relies on the remainers to pass her deal in parliament, she will risk the most profound split in the Party,” one party member, who voted leave, told Al-Ahram Weekly. “Instead of settling the European question in the party once and for all, we will face an open civil war, worse than anything we have seen so far,” she added. In Brussels, European leaders are set to sign the draft agreement and the framework of future relations on Sunday. They will also start to work on the declaration setting out the EU’s future relationship with the UK. Officially the Brexit process is moving forward, but this could be deceptive. With the endgame approaching, reluctant voices will get louder and could derail the whole process. The Spanish reaction to the draft deal has also been alarming. Prime Minister Pedro Sánchez has said Spain will reject the draft withdrawal deal if it does not receive clarification on future talks on Gibraltar. “As things stand today if there are no changes regarding Gibraltar, Spain will vote no on Brexit,” Sánchez said. May’s position is delicate, as she could lose both her Brexit deal and her job. Only the coming days will tell.